Global Recordings Network is a non-profit missionary organisation. God is the source of all we need, and he uses various channels to supply our needs. Our main 'strategy' for raising funds is to bring our needs to the Lord in prayer. We do not use aggressive fund raising techniques. We are thankful that God moves the hearts of his people to give money to enable us to carry on the ministry. Our main resource, the audio recordings on our website can be downloaded free of charge. Our other materials such as our picture books and hand wind mp3 players are generally supplied at or below cost. See our Financial Policy for more information. Find out about making a donation here. For details about financial matters in each country please contact your local centre. Adopt a Recording Project - Adopt a recording project and play a significant role in reaching an unreached people group. 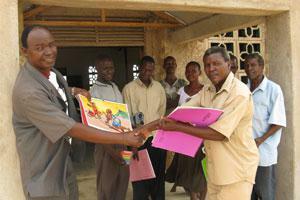 Special Distribution Funds - Help fund distribution of God's Word to many language groups. Emergency Fund - Provide emergency relief to staff members or others in times of medical emergency, political strife, disaster or persecution. Printing Fund - Funds the printing of GRN materials where they are needed, avoiding freight difficulties and costs. Equip a Recordist - Equip a recordist with recording machine, microphones, headphones and other required equipment. Support A National Worker - Many national workers face difficulties and make huge sacrifices as they serve God. Your gift will help them stay with the ministry.